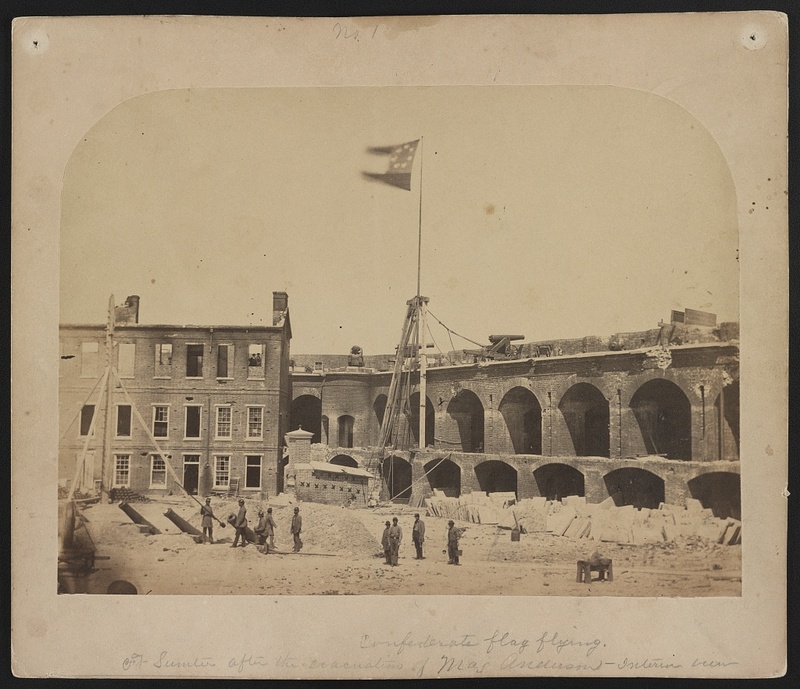 Alma Pelot’s photo of the Confederate flag flying above Fort Sumter 16 April 1861 (public domain, Library of Congress). Company K was raised with the intent of being an all-German company. Its founder, George Junker, was a 26-year-old, proud native of Germany who lived and worked as a tombstone carver in Allentown, Lehigh County, Pennsylvania, and served as a Quartermaster Sergeant with the Allen Infantry at the dawn of the Civil War. Also known as the “Allen Guards,” this group of soldiers was commanded by Captain Thomas Yeager and became the first of the Allentown militia units (and one of the first five Pennsylvania units) to respond to President Abraham Lincoln’s call for 75,000 volunteers to defend the nation’s capital following the Fall of Fort Sumter in mid-April 1861. Sergeant Junker and his fellow Allen Infantrymen were primarily engaged in the performance of guard duty during their Three Months’ service, according to various historical accounts of the period, and served from 18 April until their unit was honorably discharged on 23 July 1861. They and Pennsylvania’s other early defenders were praised by the Speaker of the U.S. House of Representatives for pushing their way through an angry mob of Confederate sympathizers in Baltimore to quickly reach and safeguard Washington’s residents. * Note: During the aforementioned mob attack in Baltimore, Sergeant Junker was briefly arrested by Confederate sympathizers and held as a prisoner; pretending to be a Union deserter, he persuaded his captors to release him so that he could join the Confederate Army. Once free, however, he made his way back to his fellow Allen Infantrymen and continued to serve the Union honorably for the duration of his service. George Junker announces formation of Civil War company of German/German-American soldiers. Der Lecha Caunty Patriot, 7 August 1861 (public domain). It’s good to hear, that Sergeant Junker, of this city, is bringing a new German company of the Lehigh Valley along under the terms of recruitment for the duration of the war. It will be particularly sweet to him if such Germans already here or abroad, who have served as soldiers, sign up immediately for him, and join the company. It can be noted that Sergeant Junker, who recently returned from the scene of the war, has done important services for the Union side in this time, and has all capabilities that are necessary for a Captain. We wish him the best luck for his company. Sergeant Junker conducted most of his outreach within Allentown’s boundaries, but also drew soldiers from Guthsville, Hazleton, Longswamp, and Saegersville, and other neighboring communities. A number of his prospects were, as he had been, early responders to President Lincoln’s call for volunteers. While some served with the Allen Infantry, others had enlisted with different regiments, but after completing their Three Months’ Service, almost all realized – as did George Junker – that the war was not yet won. So, when Sergeant Junker approached them, many enthusiastically signed up in August and September of 1861 as members of Company K with the newly formed 47th Regiment, Pennsylvania Volunteer Infantry – a regiment which had been founded by Allentown’s own Colonel Tilghman H. Good. 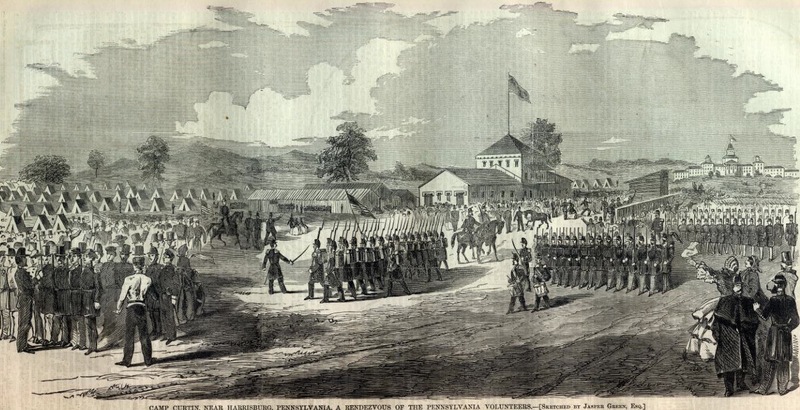 Blacksmiths, farmers, miners, saddlers, shoemakers and other laborers officially mustered in for their three-year tours of duty with the 47th Pennsylvania at Camp Curtin in Harrisburg, Dauphin County on 17 September 1861. That same day, Sergeant George Junker was promoted to the rank of Captain, and was placed in charge of his recruits. He would go on to lead Company K from its inception until 22 October 1862 when he was mortally wounded during the Battle of Pocotaligo, South Carolina. * Note: Although his new recruits could not know it as they enlisted, the majority of K Company soldiers would be led by a succession of commanding officers before the long war was over: the aforementioned Captain George Junker; Captain Charles W. Abbott, a First Defender who had re-enlisted with the 47th after protecting the nation’s capital during his Three Months’ Service, who then received a battlefield promotion with the 47th when Captain Junker was wounded in action, and then held that position as K Company’s captain until receiving a promotion to the regiment’s central command staff; and Captain Matthias Miller, who had risen steadily up from the rank of Corporal with Company K until receiving his own promotion to the rank of Captain, K Company in 1865. Following a brief training period in light infantry tactics at Camp Curtin and leaving behind Private William Schubert (alternate spelling of surname: “Schubard”) to convalesce at the camp’s hospital, the men of Company K and their fellow 47th Pennsylvanians were transported by rail to Washington, D.C. Stationed roughly two miles from the White House, they pitched tents at “Camp Kalorama” on the Kalorama Heights near Georgetown beginning 21 September. * Note: The training and departure process was clearly a hectic one. Private Elias Reidy (alternate spelling: “Ready”) was felled by “friendly fire” from an errant pistol shot; hospitalized, he was discharged on a Surgeon’s Certificate of Disability just over two months later on 26 November. Meanwhile, Private William Schubert was incorrectly labeled a deserter when the scribe in charge of the regiment’s muster rolls failed to update his entry to note that he had also been left behind at the camp hospital for disease-related treatment as the regiment moved on to the nation’s capital. Spelling variants of the private’s surname (Schubard, Schubert) also likely contributed to this confusion. Acclimated somewhat to their new way of life, the soldiers of the 47th Regiment, Pennsylvania Volunteer Infantry finally became part of the U.S. Army when they were officially mustered into federal service on 24 September. The next morning, they broke camp and moved again. Marching toward Falls Church, Virginia, they arrived at Camp Advance around dusk. There, about two miles from the bridge they had crossed a day earlier, they re-pitched their tents in a deep ravine near a new federal fort under construction (Fort Ethan Allen). They had completed a roughly eight-mile trek, were situated fairly close to General W.F. Smith’s headquarters, and were now part of the massive Army of the Potomac. Under Smith’s leadership, their regiment and brigade would help to defend the nation’s capital from the time of their September arrival through late January when the men of the 47th Pennsylvania would be shipped south. I. 15 minutes after breakfast every tent will be cleaned. The commander of each tent will be held responsible for it, and every soldier must obey the orders of the tent commander. If not, said commanders will report such men to the orderly Sgt. who will report them to headquarters. II. There will be company drills every two hours during the day, including regimental drills with knapsacks. No one will be excused except by order of the regimental surgeon. The hours will be fixed by the commander, and as it is not certain therefore, every man must stay in his quarter, being always ready for duty. The roll will be called each time and anyone in camp found not answering will be punished the first time with extra duty. The second with carrying the 75 lb. weights, increased to 95 lb. The talking in ranks is strictly forbidden. The first offense will be punished with carrying 80 lb. weights increased to 95 lbs. for four hours. As a reward for the regiment’s impressive performance that day – and in preparation for the even bigger adventures and honors that were yet to come, Brigadier-General Brannan ordered his staff to ensure that brand new Springfield rifles were obtained and distributed to every member of the 47th Pennsylvania Volunteers. Sometime during the month of November or December, Private Joseph Bachman (alternate spelling: “Backman”) suffered a ruptured hernia; he was subsequently discharged on a Surgeon’s Certificate of Disability on 16 December. The New Year brought several changes to the regiment, including the departures of 1st Lieutenant and Regimental Adjutant James W. Fuller, Jr. on 9 January and Private Paul Ferg, a saddler by trade who fell ill due to exposure from the cold and damaged his hearing, was discharged on a Surgeon’s Certificate of Disability on 20 January. Next ordered to move from their Virginia encampment back to Maryland, the 47th Pennsylvania Volunteers left Camp Griffin at 8:30 a.m. on Wednesday, 22 January 1862, marching through deep mud with their equipment for three miles in order to reach the railroad station at Falls Church. Sent by rail to Alexandria, they then sailed the Potomac via the steamship City of Richmond to the Washington Arsenal, where they were reequipped before they were marched off for dinner and rest at the Soldiers’ Retreat in Washington, D.C. The next afternoon, the 47th Pennsylvanians hopped rail cars on the Baltimore & Ohio Railroad, and headed for Annapolis, Maryland. Arriving around 10 p.m., they were assigned quarters in barracks at the Naval Academy. They then spent that Friday through Monday (24-27 January 1862) loading their equipment and other supplies onto the steamship Oriental. 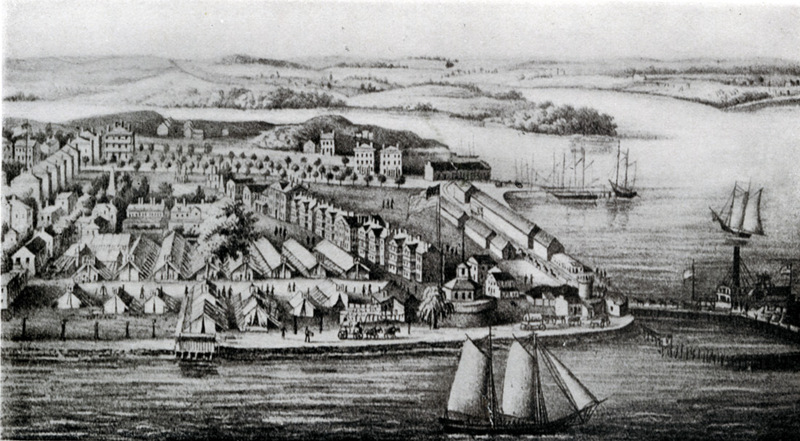 By the afternoon of Monday, 27 January, the 47th Pennsylvania Volunteers had commenced boarding the Oriental. Ferried to the big steamship by smaller steamers, the enlisted men boarded first, followed by the officers. Then, per the directive of Brigadier-General Brannan, the Oriental steamed away for the Deep South at 4 p.m. 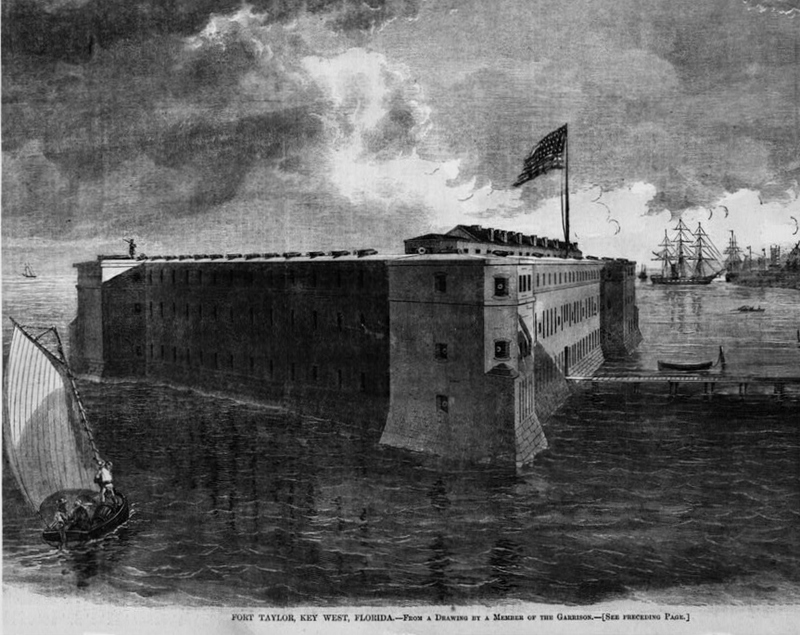 The 47th Pennsylvanians were headed for Florida which, despite its secession from the United States, remained strategically important to the Union due to the presence of Forts Taylor and Jefferson in Key West and the Dry Tortugas. * Note: Sometime while stationed at Camp Griffin, Private Andres Snyder became one of several members of the 47th Pennsylvania to be felled by disease; confined to the post hospital for treatment, he was left behind as the regiment moved on. He was subsequently discharged on a Surgeon’s Certificate of Disability on 3 June 1862. Company K and their fellow 47th Pennsylvania Volunteers arrived in Key West by early February 1862. There, they were assigned to garrison Fort Taylor. During the weekend of Friday, 14 February, the 47th Pennsylvania Volunteers introduced their presence to Key West residents by parading through the streets of the city. That Sunday, a number of soldiers from the regiment attended to their spiritual needs by sitting in on the services at local churches, where they also met and mingled with residents from the area. Drilling daily in heavy artillery tactics, they strengthened the fortifications at this federal installation, felled trees and built new roads. Pvt. Schirer was buried in grave #6 at the Key West Post Cemetery, but his remains lost their identity enroute [sic] to Fort Barrancas National Cemetery, where he is buried as an unknown in a group of 228…. “And as if this were not enough, Pvt. George Leonard of Company K died in the General Hospital at Key West on Saturday, April 19. He was a miner in civilian life and was another member lost to Typhoid. His remains were originally buried in grave #9 at the Key West Post Cemetery and later removed to Fort Barrancas National Cemetery Section 17, grave 163…. Pvt. Lewis Dipple … former locksmith died in the General Hospital at Key West, and was buried in grave #10 at the Key West Post Cemetery, when the cemetery was abandoned and the bodies moved to Fort Barrancas National Cemetery, his body was one that was mishandled, and his remains are buried in a group of 228 unknown graves. Pvt. Fisher would never make it home, as he died in a New York hospital just three weeks later while enroute to Longswamp. The 21 year old Musician Fritz, a laborer from Allentown who had performed in such a lively manner on board ship while the 47th was enroute to Key West, now had failing eyesight and was sick with typhoid fever…. On Tuesday, August 19 , Pvt. Rudolph W. Fisher, a teamster with Company K, who had been discharged with a surgeon’s certificate on July 29, died in the hospital in New York of chronic diarrhea. Pvt. Fisher was 35 years old and a carpenter from Longswamp, Pa. Along with Cpl. Williamson who was discharged and would die at home on August 29, his was another death not available to statistical analysis, since both died as civilians. The third of the eight men who had been left behind at Key West, died on Tuesday, July 22. Pvt. Martin Muench [sic] of Company K, a 39 year old miner from Allentown was the victim of chronic diarrhea. Pvt. Muench had originally been buried in grave #40 of the Key West Post Cemetery, but when his body was removed in 1927 for relocation to the Fort Barrancas Cemetery, it was mishandled resulting in the loss of identification, and burial in an unknown grave…. Pvt. Frederick Neussler of Company K died at the Key West Hospital on Wednesday, August 20 , from typhoid fever. The 24 year old miner from Hazelton had been left behind with the other hospitalized members of the regiment when it left for Beaufort. The young man’s illness may have been complicated by his reported chronic diarrhea and the yellow fever epidemic which was just beginning at Key West. His remains were originally interred in grave #65 of the Key West Post Cemetery, but their identity was lost when the bodies were removed to Fort Barrancas Cemetery in 1927. Meanwhile, the remainder of the regiment continued to soldier on. From 20-31 August 1862, Company K resumed picket duty, this time stationed at “Barnwells” (so labeled by Company C Captain J. P. S. Gobin) while other companies from the regiment performed picket duty in the areas around Point Royal Ferry. But the month of September brought new changes. Sometime during late August, Private Frederick Sackenheimer (alternate spellings: “Sachsenheimer,” “Saxonheimer”) fell while marching double-quick with the regiment. The fall, severe enough to cause a ruptured hernia, resulted in his discharge on a Surgeon’s Certificate of Disability on 1 September 1862. That same day (1 September), musician-privates William A. Heckman (a fifer) and Daniel Dachrodt (a drummer whose surname was spelled incorrectly on Bates’ roster as “Dackratt”), were promoted from the rank of Musician to Principal Musician. Dachrodt would go on to serve with his regiment for the duration of the war, and live to become the last surviving member of the 47th Pennsylvania’s Regimental Band. His final drum beat was struck during a 1939 performance. * Note: Although a 2011 article about Daniel Dachrodt and his brothers, which currently appears on the Sigal Museum’s website (and which also appeared in Easton, Pennsylvania’s The Express-Times), stating that Daniel Dachrodt served with the Company H of the 47th Pennsylvania Volunteers, Dachrodt’s entry in the Civil War Veterans’ Card File at the Pennsylvania State Archives indicates that he served as a member of the 47th Pennsylvania’s Regimental Band, and re-enlisted in December 1862 with the 47th’s Company K.
On 16 September, Private Patrick McFarland became the next member of K Company to die while in service; he passed away while stationed at Fort Jefferson. During a return expedition to Florida beginning 30 September, the 47th joined with the 1st Connecticut Battery, 7th Connecticut Infantry, and part of the 1st Massachusetts Cavalry in assaulting Confederate forces at their heavily protected camp at Saint John’s Bluff overlooking the Saint John’s River area. Trekking and skirmishing through roughly 25 miles of dense swampland and forests after disembarking from ships at Mayport Mills on 1 October, the 47th captured artillery and ammunition stores (on 3 October), which had been abandoned by Confederate forces due to the bluff’s bombardment by Union gunboats. * Note: The capture of Saint John’s Bluff followed a string of U.S. Army and Navy successes which enabled the Union to gain control over key southern towns and transportation hubs. In November 1861, the Union’s South Atlantic Blockading Squadron established a base at Port Royal, South Carolina, enabling the Union to mount expeditions to Georgia and Florida. During these forays, U.S. troops took possession of Fort Clinch and Fernandina, Florida (3-4 March 1862), secured the surrender of Fort Marion and Saint Augustine (11 March), and established a Union Navy base at Mayport Mills (mid-March). That summer, Brigadier-General Joseph Finnegan, commanding officer of the Confederate States of America’s Department of Middle and Eastern Florida, placed gun batteries atop Saint John’s Bluff overlooking the Saint John’s River and at Yellow Bluff nearby. Fortified with earthen works, the batteries were created to disable the Union’s naval and ground force operations at and beyond Mayport Mills, and were designed to house up to 18 cannon, including three eight-inch siege howitzers and eight-inch smoothbores and Columbiads (two of each). After an exchange of fire between U.S. gunboats Uncas and Patroon and the Rebel battery at Saint John’s Bluff on 11 September, Rebel troops returned after initially being driven away. When a second, larger Union gunboat flotilla also failed to shake the Rebels loose again six days later, Union military leaders ordered a more aggressive operation combining ground troops with naval support. J.H. Schell’s 1862 illustration showing the earthen works which surrounded the Confederate battery atop Saint John’s Bluff along the Saint John’s River in Florida (public domain). With those successes, Union leaders ordered the gunboats and army troops to extend the expedition. As they did, they captured assorted watercraft as they advanced farther up the river. Companies E and K of the 47th were then led by Captain Yard on a special mission; the men of E and K Companies joined with other Union Army soldiers in the reconnaissance and subsequent capture of Jacksonville, Florida on 5 October 1862. 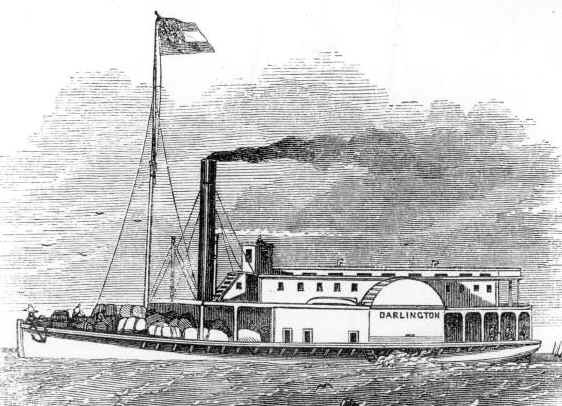 A day later, sailing up river on board the Union gunboat Darlington (formerly a Confederate steamer) – with protection from the Union gunboat Hale, men from the 47th Pennsylvania’s Companies E and K then traveled 200 miles along the Saint John’s River. Another Confederate steamer, the Gov. Milton, was reported to be docked near Hawkinsville, and had been engaged in furnishing troops, ammunition and other supplies to Confederate Army units scattered throughout the region, including the batteries at Saint John’s Bluff and Yellow Bluff. 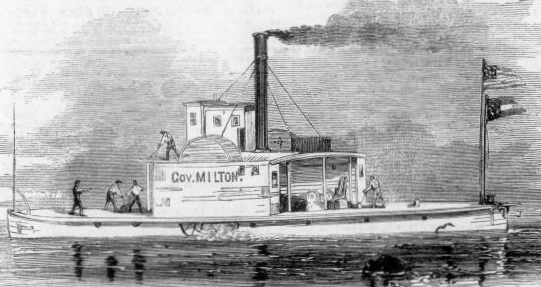 The rebel steamer Governor Milton, captured by the U.S. flotilla in St. John’s River, Florida, Frank Leslie’s illustrated newspaper). Courtesy: State Archives of Florida, Florida Memory Project (public domain). Identified as a thorn that needed to be plucked from the Union’s side, the Gov. Milton was seized by the soldiers from the 47th Pennsylvania’s Companies E and K with support from other Union troops. Having ventured deep into Confederate territory, Union Army expedition leaders determined that their troops had achieved enough success for the risks taken, and ordered the combined Union Army-Navy team to sail the Gov. Milton back down the Saint John’s River before moving the steamer and other captured ships behind Union lines. From 21-23 October, under the brigade and regimental commands of Colonel Tilghman Good and Lieutenant Colonel George Warren (“G. W.”) Alexander, the entire 47th Regiment, Pennsylvania Volunteer Infantry joined with other Union regiments to engage the heavily protected Confederate forces in and around Pocotaligo, South Carolina – including at Frampton’s Plantation and the Pocotaligo Bridge – a key piece of the South’s railroad infrastructure which Union leaders felt should be destroyed. Those headed toward higher ground at the Frampton Plantation fared no better as they encountered artillery and infantry fire from the surrounding forests. But the Union soldiers would not give in; grappling with the Confederates where they found them, they pursued the Rebels for four miles as the Confederate Army retreated to the bridge. There, the 47th relieved the 7th Connecticut. Pocotaligo-Coosawhatchie Expedition, 21-23 October 1862 (Union Army, public domain). Unfortunately, the enemy was just too well armed. After two hours of intense fighting in an attempt to take the ravine and bridge, the 47th was forced by depleted ammunition supplies to withdraw to Mackey’s Point. Losses for the 47th Pennsylvania were significant. Captain Charles Mickley of G Company died where he fell from a gunshot wound to his head while K Company Private John McConnell was also killed in action. K Company Captain George Junker was mortally wounded by a minie ball from a Confederate rifle during the intense fighting near the Frampton Plantation, as were Privates Abraham Landes (alternate spelling: “Landis”) and Joseph Louis (alternate spelling: “Lewis”). All three died the next day while being treated for their wounds at the Union Army’s General Hospital at Hilton Head, South Carolina. Private John Schuchard, who was also mortally wounded at Pocotaligo, died from his wounds at the same hospital on 24 October. Der Lecha Caunty Patriot‘s 3 December 1862 issue noted the return to Pennsylvania of the remains of 47th Pennsylvanians: Henry A. Blumer, Aaron Fink, Henry Zeppenfeld, and Captain George Junker (public domain). Although a Find A Grave memorial for Captain Junker currently indicates that he was laid to rest at the Beaufort National Cemetery in Beaufort, South Carolina, the 3 December 1862 edition of Der Lecha Caunty Patriot, a German language newspaper serving the Lehigh Valley region of Pennsylvania during this time, reported that his remains were returned to family in Hazleton, Luzerne County for reburial. 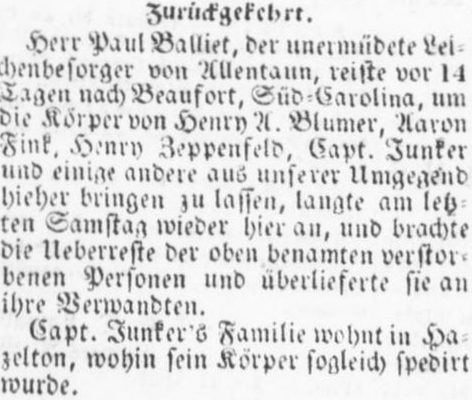 Roughly translated, it also noted that Allentown undertaker, Paul Balliet, and several others from the area, had spent 14 days traveling to and from Beaufort to exhume and return the bodies (Körper) of Junker and several other members of the regiment. Privates Abraham Landes, Joseph Louis, and John Schuchard were, however, apparently buried at Beaufort. Private Gottlieb Fiesel, who had also sustained a head wound, somehow survived. Although the left side of his head had been damaged and his skull fractured by shrapnel from an exploding artillery shell, physicians were hopeful that he might recover since surgeries to remove bone fragments from his brain had been successful, but he contracted meningitis while recuperating and passed away at Hilton Head on 9 November 1862. He, too, was interred at the Beaufort National Cemetery. Private Edward Frederick lasted a short while longer, finally succumbing on 16 February 1863 at Fort Jefferson in the Dry Tortugas, Florida to brain fever, a complication from the personal war he had waged with his battle wounds. He was initially buried at the fort’s parade grounds. Private Jacob Hertzog, 47th Pennsylvania Volunteers – Co. K, successfully recovered from a gunshot wound to his right arm. Source: U.S. Surgeon General’s Office (public domain, c. 1866). K Company’s Corporal John Bischoff and Privates Manoah J. Carl, Jacob F. Hertzog, Frederick Knell, Samuel Kunfer, Samuel Reinert, John Schimpf, William Schrank, and Paul Strauss were among those wounded in action who rallied. Private Strauss miraculously survived an artillery shell wound to his right shoulder, recuperated, and continued to serve with the regiment. Private Knell was discharged on a Surgeon’s Certificate of Disability on 9 May 1863. [A]dmitted to Hospital. No. 1, Beaufort, S.C., with gunshot wound of right elbow joint, the ball entering the outer, and emerging just above the inner condyle of the humerus of on [sic] the opposite side. Oct. 26t. Exsection of the lower end of humerus, and articulating ends of the ulna and radius was performed, and the arm laid upon an angular splint of two parallel strips, leaving an open space the whole extent, thus rendering approach to the wound of exit easy. Morph. sulph. was applied to the wound, and a dressing of serate cloth to cover the whole, a bag of ice was also applied. Nov. 1st. Suppuration considerable, but the great tumefaction of the arm and forearm, much diminished. Nov. 15th. The sutures of lead wire were to-day removed, the wound having healed sufficiently to keep the parts in shape. The general condition of the patient improved. Dec. 15th. The patient has been for some days dressed and walking about the grounds. The wound is nearly healed, the elbow admitting of free motion in every direction. Dec.28th. The wound has been some days healed, there are no discharges, the patient was to-day sent north per steamer ‘Star of the South.’ The good result attained in the above case, may without doubt, be attributed partially to the excellent condition of the patient; he never having used in his life, either alcoholic or malt liquors, neither tea, coffee, nor tobacco. The command vacancy created when Captain George Junker fell in battle at Pocotaligo was immediately filled when 1st Lieutenant Charles W. Abbott was advanced to the rank of Captain that same day. On 27 October 1862, 1st Sergeant Alfred P. Swoyer was honorably discharged from Company K in order to re-enlist as a 2nd Lieutenant with the same unit and regiment. He re-enlisted that same day at Fort Jefferson in the Dry Tortugas, Florida. Having been ordered back to Key West on 15 November 1862, much of 1863 was spent garrisoning federal installations in Florida as part of the U.S. Army’s 10th Corps, Department of the South. 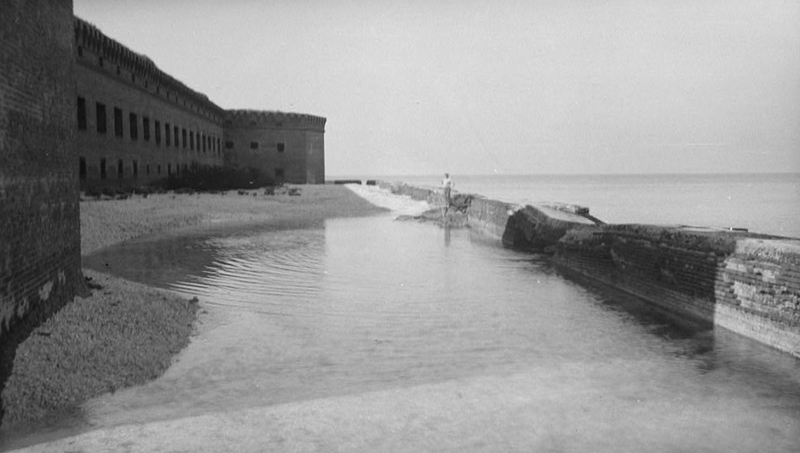 The men of K Company joined with Companies D, F, and H in garrisoning Fort Jefferson in the Dry Tortugas. So remotely situated off the coast of Florida was this Union outpost that it was accessible only by ship. Meanwhile, Companies A, B, C, E, G, and I continued to guard Key West’s Fort Taylor. While serving as a 2nd Lieutenant at Fort Jefferson under Lieutenant Colonel George W. Alexander, Company K’s David K. Fetherolf was promoted to the rank of First Lieutenant on 2 May 1863; he was then appointed Acting Quartermaster at Fort Jefferson in August 1863, and continued in this role through at least December of that year. As with their previous assignments, the men soon came to realize that disease would be their constant devil, making it all the more remarkable that, during this phase of service, the majority of the 47th Pennsylvania Volunteers chose to re-enlist when their three-year service terms were up. Many, who could have returned home with their heads legitimately held high after all they had endured, re-enlisted in order to preserve the Union of their beloved nation. Private Martin Münch (alternate spellings: “Muench,” “Munch”) became one of those men from the 47th Pennsylvania felled by disease during this phase of service; he died from disease-related complications at the Union’s post hospital at Fort Taylor in Key West on 22 July 1863. As the Fall of 1863 arrived, departures from the regiment continued. Private John Koffler was sent home via a Surgeon’s Certificate of Disability on 7 September while on 1 October, K Company’s Private Elias Huhn died at the Union Army’s General Hospital at Hilton Head, South Carolina. He was felled by anasarca, a form of edema common to those suffering from malnutrition, heart or kidney disease. The holidays had been times of both celebration and hardship for members of the 47th Pennsylvania. Stationed far from home, many would mark another year away from friends and family with promotions following their re-enlistment at Fort Taylor or Fort Jefferson. Corporal Matthias Miller was one such man; he advanced to the rank of 1st Sergeant on New Year’s Day. Then, on 25 February 1864, the 47th set off for a phase of service in which the regiment would truly make history. Steaming for New Orleans aboard the Charles Thomas, the men arrived at Algiers, Louisiana on 28 February. 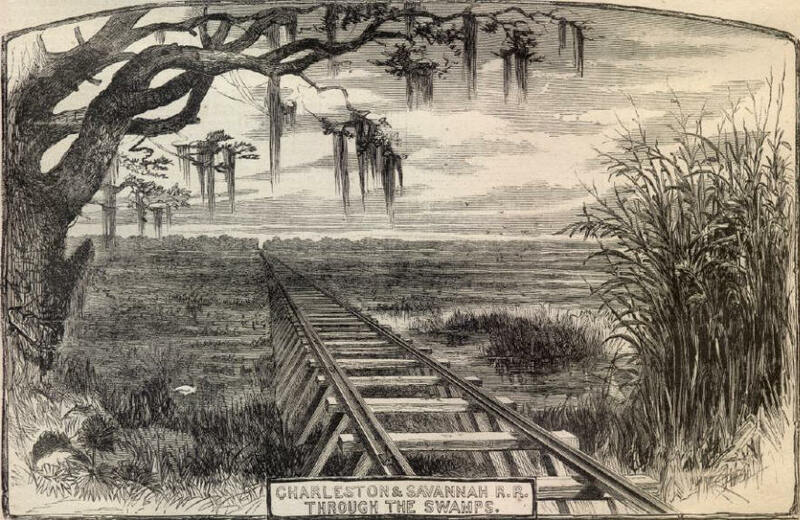 Transported next by train to Brashear City and following another steamer ride – this time to Franklin via the Bayou Teche, the 47th joined the 2nd Brigade, 1st Division of the Department of the Gulf’s 19th Army Corps, becoming the only Pennsylvania regiment to serve in the Red River Campaign spearheaded by Union General Nathaniel P. Banks. Private David Klotz was transferred to the Veteran Reserve Corps (also known as the “invalid corps”) on 1 March. Ten days later, Privates William Brecht, Werner Erbe and John Hinderer were all also transferred to the Veteran Reserve Corps while Private John F. Fersch was discharged on a Surgeon’s Certificate of Disability. From 14-26 March, the 47th passed through New Iberia, Vermillionville, Opelousas, and Washington while en route to Alexandria and Natchitoches. Often short on food and water while slogging through an unbearably harsh climate in challenging terrain, the remaining members of the regiment encamped briefly at Pleasant Hill the night of 7 April before continuing on the next day. Marching until mid-afternoon, the 47th Pennsylvanians were then rushed into battle ahead of other regiments in the 2nd Division. Sixty members of the 47th were cut down on 8 April during the volley of fire unleashed during the Battle of Sabine Cross Roads (Mansfield). The fighting waned only when darkness fell. The exhausted, but uninjured collapsed beside the gravely wounded. After midnight, the surviving Union troops withdrew to Pleasant Hill. Company K’s 2nd Lieutenant Alfred P. Swoyer was one of those killed in action at Mansfield. Casualties were severe. Privates Nicholas Hagelgans, Jacob Madder and Samuel Wolf of K Company were all killed in action. The regiment’s second in command, Lieutenant Colonel Alexander, was nearly killed, and the regiment’s two color-bearers, both from Company C, were also seriously wounded while preventing the American flag from falling into enemy hands. Still others from the 47th were captured by Confederate troops. Held initially as prisoners of war at Pleasant Hill and Mansfield, Louisiana, they were subsequently marched roughly 125 miles to Camp Ford, a Confederate Army prison camp near Tyler, Texas, and held there as POWs until they were released during prisoner exchanges beginning 22 July. Private Ben Zellner of K Company, who had been shot in the leg and ultimately ended up being wounded in action a total of four times during 1864, was one of the men carted off to Camp Ford. After some time as a POW at Camp Ford near Tyler Texas, Private Zellner became one of 300 to 400 men deemed well enough by Camp Ford officials to be shipped to Shreveport, Louisiana. They were then transported on by rail to the notorious Confederate POW camp at Andersonville, Georgia. Held there until his release in September 1864, Zellner recovered and continued to serve with the 47th Pennsylvania Volunteers. He was then wounded in action again during the Battle of Cedar Creek, Virginia on 19 October 1864. * Note: Although Camp Ford records (under the surname of “Cellner”) show that Benjamin Zellner was released during a prisoner exchange on 22 July 1864, Ben Zellner stated in multiple newspaper accounts after war’s end that he had been shipped off to Andersonville and held there until his release in September 1864. While Private Benjamin Zellner being held Andersonville, other members of the 47th Pennsylvania remained imprisoned at Camp Ford in Texas. Sadly, at least two members of the 47th never made it out alive. Following what some historians have called a rout by Confederates at Pleasant Hill and others have labeled a technical victory for the Union or a draw for both sides, the 47th Pennsylvanians fell back to Grand Ecore to resupply and regroup until 22 April. Retreating to Alexandria, they and their fellow Union soldiers next scored a clear victory against the Confederates near Monett’s Ferry in the Battle of Cane River on 23 April 1864. 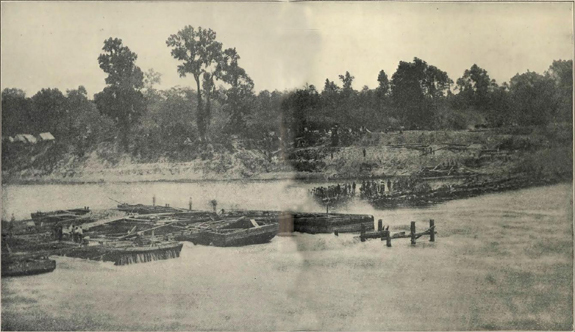 Christened “Bailey’s Dam” for the Union officer who ordered its construction, Lt. Col. Joseph Bailey, this timber dam built by the Union Army across the Red River near Alexandria, Louisiana in May 1864 facilitated passage of Union gunboats (public domain). Just seven days later, K Company’s Private William Walbert was gone, having succumbed to disease-related complications at a Union Army hospital in New Orleans. Meanwhile, from April 30 to 10 May, while temporarily assigned to the command of Lieutenant Colonel Joseph Bailey, the remaining men of Company K and their fellow 47th Pennsylvanians helped to build a dam to enable federal gunboats to more easily traverse the rapids of the Red River. Beginning 16 May, Captain Charles Abbott and the men from K Company then moved with the majority of the 47th from Simmsport across the Atchafalaya to Morganza, Louisiana. Sometime during this phase of duty, Private Matthias Gerrett (alternate spelling of surname: “Garrett”) fell ill with typhoid fever; he was confined to the Union Army’s Barracks Hospital in New Orleans, and passed away there on 24 May. Meanwhile, the regiment continued on, reaching New Orleans on 20 June. * Note: Although various historical sources place the death of Private Matthias Gerrett as 22 May 1864 or 30 October 1865 and his cause of death as congestive fever, his entry in the U.S. Army’s Register of Deaths of U.S. Volunteer Soldiers states that he succumbed to typhoid fever at the Union’s Barracks Hospital in New Orleans on 24 May 1864. Then, in June of 1864, Company K lost another of its members when Private Paul Houser died while on furlough; he was among those men who drowned near Cape May, New Jersey during the sinking of the steamer Pocohontas. Follow-up coverage in the New York Times reported that many of the men who lost their lives were on their way home, having been wounded in action or taken ill while in service to their nation. Others who had been left behind in Louisiana to convalesce also perished during these blistering months, including Private Charles Resch who died at a Union Army hospital in Baton Rouge on 18 August and Private Solomon Long who, had contracted typhoid fever while serving with his regiment in Louisiana and then developed disease-related complications, died during his confinement at the Union’s Marine Memorial General Hospital in New Orleans three days later from typhoid fever and related complications. A number of 47th Pennsylvanians felled in bayou country during that Summer of 1864 were laid to rest at the Chalmette National Cemetery in St. Bernard’s Parish; still others were interred at the Baton Rouge National Cemetery. The graves of all too many, however, still remain unidentified. The fight to preserve America’s Union and the service by Pennsylvania’s 47th Volunteer Infantry was, however, far from over. Undaunted by their travails in Bayou country, the majority of 47th Pennsylvania Volunteers willingly continued their fight to preserve the Union during the summer of 1864. After receiving orders on the 4th of July to return to the East Coast, they did so in two stages. Companies A, C, D, E, F, H, and I steamed for the Washington, D.C. area beginning 7 July while the men from Companies B, G and K remained behind on detached duty and to await transportation. 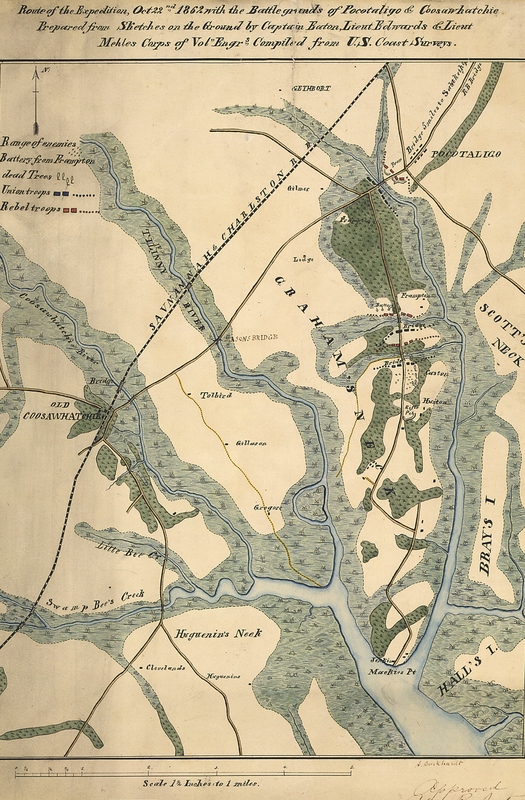 Led by F Company Captain Henry S. Harte, they finally sailed away at the end of the month, arrived in Virginia on 28 July, and reconnected with the bulk of the regiment at Monocacy, Virginia on 2 August. Due to the delay, the boys from K Company missed out on a memorable encounter with President Abraham Lincoln, and also missed the fighting at Snicker’s Gap, Virginia. On 1 August, K Company received word that their own 1st Sergeant Matthias Miller would be promoted again, advanced this time to the rank of 2nd Lieutenant; in addition, Corporal Franklin Beisel became 1st Sergeant Beisel that same day, and Private Samuel Reinert was promoted to the rank of Corporal. Attached to the Middle Military Division, Army of the Shenandoah beginning in August, the 47th Pennsylvania Volunteer Infantry was assigned to defensive duties in and around Halltown, Virginia in early August, and also engaged over the next several weeks in a series of back-and-forth movements between Halltown, Berryville and other locations within the vicinity (Middletown, Charlestown and Winchester) as part of a “mimic war” being waged by Sheridan’s Union forces with those commanded by Confederate Lieutenant-General Jubal Early. K Company also continued to lose members during this phase of duty. Among those who were honorably discharged were: Privates Martin Reifinger and Elenois Druckenmiller who departed via Surgeons’ Certificates of Disability on 3 and 18 August, respectively, and Private Conrad Nagle (alternate spellings: “Nagel,” “Neihl,” “Niehl”), who fell ill and was confined to the Union Army’s hospital at Virginia’s Fairfax Seminary near Alexandria, Virginia before succumbing to disease-related complications there on 22 August. Private Charles Richter died at the Union Army’s Newton General Hospital in Baltimore on 1 September. The likely cause of his death was dysentery. 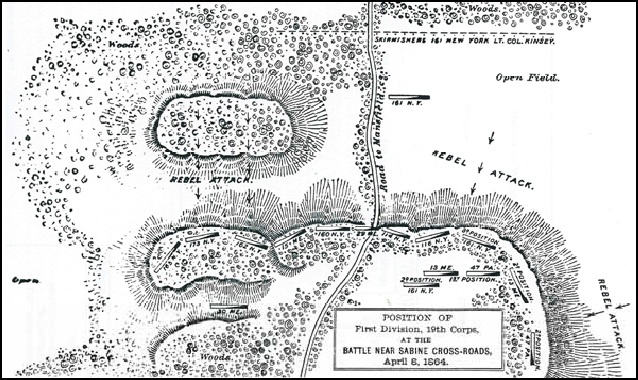 The 47th Pennsylvania engaged in its next major encounter during the Battle of Berryville, Virginia from 3-4 September. Several men were killed or wounded in action during the battle and its aftermath, including Private George Kilmore (alternate spelling “Killmer”), who sustained a fatal gunshot wound to the abdomen on 5 September. On 14 September, Corporal Elias F. Benner was promoted to the rank of Sergeant. Additional men departing around this time from the 47th Pennsylvania Volunteers were: Company D’s Captain Henry Woodruff, E Company’s Captain Charles H. Yard and Captain Henry S. Harte of F Company, as well as K Company’s Sergeant-Major Conrad Volkenand, Sergeant Peter Reinmiller, Corporals Lewis Benner and George Knuck, and Privates Valentine Amend, M. Bornschier, Charles Fisher, Charles Heiney, Jacob Kentzler, John Koldhoff, Anthony Krause, Elias Leh, Samuel Madder, Lewis Metzger, Alfred Muthard, John Schimpf, John Scholl, and Christopher Ulrich. All mustered out at Berryville, Virginia on 18 September 1864 upon expiration of their respective three-year terms of service. Those members of the 47th who remained on duty were about to engage in their regiment’s greatest moments of valor. Together with other regiments under the command of Union General Philip H. (“Little Phil”) Sheridan and Brigadier-General William H. Emory, commander of the 19th Corps, the members of Company K and their fellow 47th Pennsylvanians helped to inflict heavy casualties on Lieutenant General Jubal Early’s Confederate forces in the Battle of Opequan (also spelled as “Opequon” and referred to as “Third Winchester”). The battle is still considered by many historians to be one of the most important during Sheridan’s 1864 campaign; the Union’s victory here helped to ensure the reelection of President Abraham Lincoln. Meanwhile, the 47th Pennsylvania and the 19th Corps were directed by General William Emory to attack and pursue Major General John B. Gordon’s Confederate forces. Some success was achieved, but casualties mounted as a Confederate artillery group opened fire on Union troops trying to cross a clearing. 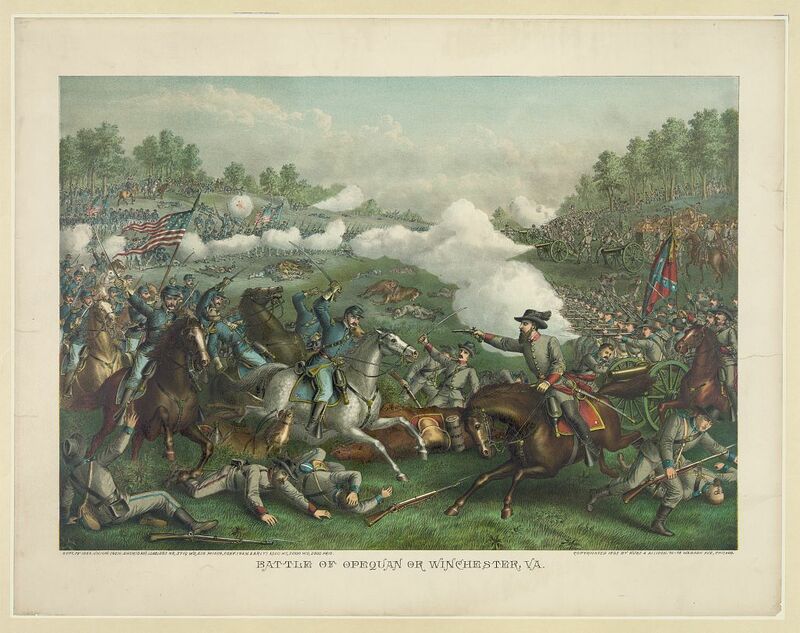 When a nearly fatal gap began to open between the 6th and 19th Corps, Sheridan sent in units led by Brigadier-Generals Emory Upton and David A. Russell. Russell, hit twice – once in the chest, was mortally wounded. The 47th Pennsylvania opened its lines long enough to enable the Union cavalry under William Woods Averell and the foot soldiers of General George Crook to charge the Confederates’ left flank. On 19 September, the same day as the Battle of Opequan, Privates Samuel Kunfer, William Landis and Christian Weidenbach were promoted to the rank of Corporal. Moving forward, the surviving members of the 47th Pennsylvania Volunteers would continue to distinguish themselves in battle, but they would do so without two more of their respected commanders: Colonel Tilghman H. Good and Good’s second in command, Lieutenant Colonel George Alexander, who mustered out 23-24 September upon the expiration of their respective terms of service. Fortunately, they were replaced with leaders who were equally respected for their front line experience and temperament, including Major John Peter Shindel Gobin, formerly of the 47th’s Company C, who had been promoted up through the regimental staff to the rank of Major (and who would be promoted again on 4 November to the rank of Lieutenant Colonel and regimental commanding officer). On 26 September, Private Edwin Person became Corporal Person. Once again, casualties for the 47th were high. Sergeant William Pyers, the C Company man who had so gallantly rescued the flag at Pleasant Hill was cut down and later buried on the battlefield. Privates Lewis Berliner and and Lewis Schneck of K Company were killed in action, as was Private Moses Klotz, who sustained a fatal head wound. Private John Kolb (alternate spelling: “Kolp”) died two days later – from an unseen foe. He succumbed to typhoid fever at the Jarvis General Hospital in Baltimore on 21 October 1864 while Private Philip W. Detzius (alternate spelling: “Datzius”) died from disease-related complications at the Union Army’s Lovell General Hospital at Portsmouth Grove, Rhode Island on 9 November 1864. Sergeant William H. Burger of Company K fought valiantly to survive the wound to his head by an artillery shell fragment or musket ball which compressed his brain, but ultimately died from that traumatic brain injury on 5 November 1864 at the Union Army’s Satterlee General Hospital in Philadelphia. Private Harrison Fegely was seriously enough wounded that, after recuperating, he was transferred to Company E of the 21st Regiment, 1st Battalion of the Veteran Reserve Corps (also known as the “invalid corps”) while 1st Lieutenant David K. Fetherolf, also seriously wounded in battle, returned home to Heidelberg Township in Lehigh County, Pennsylvania after recuperating enough to be discharged on 17 November 1864. He survived until the Summer of 1865. Nearly half a century later, at their annual regimental reunion in 1907, his former comrades celebrated his bravery that terrible day at Cedar Creek, and recalled his burial with full military honors, including the salute fired over his grave by the Allen Rifles. K Company Corporals Joseph Frack and William Landis were more fortunate, as was Private James Strauss; wounded in action, they survived and continued to serve with the regiment, as did Regimental Chaplain William Rodrock, who suffered a near miss when a bullet pierced his cap. Private Hiram Kolb was also wounded, but allegedly deserted on 27 November. Also wounded in action was Private Peter Cope, who was treated for his injuries until finally well enough to be discharged on a Surgeon’s Certificate of Disability from a Union Army hospital on 22 June 1865. Comrade Ben Zellner of 610 Gordon Street, one of the youngest veterans of the Civil War in all of America, is today celebrating his 66th birthday anniversary. Born March 26, 1849, Comrade Zellner was only 13 years, 3 months and 3 days old when he enlisted in the 167th Pennsylvania Regiment on July 9, 1862. Although there were a few younger soldiers in the Civil War, it is claimed by friends of Comrade Zellner that he was the very youngest soldier to go out carrying a musket, the younger ones being drummer boys…. After a short service with the 167th, he enlisted in the celebrated 47th Pennsylvania Volunteers … that served all the way from Pocotaligo, S. Ca., and Key West to the Red River expedition and the Shenandoah Valley, where they fought in the battle of Cedar Creek and saw ‘Sheridan’s Ride’…. Comrade Zellner endured all the horrors of Andersonville Prison for 6 months and 14 days, until exchanged. He was wounded four times, twice at Pleasant Hill, La., twice at Cedar Creek, and still carries a Cedar Creek bullet in his right ankle…. Still others were captured and held as prisoners of war, several of whom died while being held at the Confederate Army’s prison camp at Salisbury, North Carolina. In addition, another member of the 47th ended up at the Rebels’ version of Hell – the Andersonville prison in Georgia. Sergeant William Fry of Company C survived long enough to be released and sent home to Pennsylvania only to die in Sunbury, Pennsylvania a few short months falling ill while confined as a POW. Following these major engagements, the 47th was ordered to Camp Russell near Winchester from November through most of December. On 4 November 1864, Corporal George J. Scherer was promoted to the rank of Sergeant. Rested and somewhat healed, the 47th was then ordered to outpost and railroad guard duties at Camp Fairview in Charlestown, West Virginia. Private Christian F. Weiland (alternate spelling: “Wieland”) was promoted to the rank of Assistant Surgeon on 13 December. Two days later, Private William Schearer became another member of Company K to be discharged on a Surgeon’s Certificate of Disability. Five days before Christmas they trudged through a snowstorm in order to reach their new home. New responsibilities arrived with the New Year of 1865 as Captain Charles W. Abbott was promoted from his leadership of K Company to the rank of Lieutenant Colonel with the 47th Pennsylvania’s central command staff on 3 January. Matthias Miller was then awarded command of Company K the following day, promoted from his role as 2nd Lieutenant to Captain on 4 January 1865. On 23 January, Sergeant Elias F. Benner was promoted to the rank of 2nd Lieutenant, and 1st Sergent Franklin Beisel advanced to the rank of 1st Lieutenant. The next day, Sergeant George J. Scherer became 1st Sergeant Scherer, and Corporal John Bischoff, who had been wounded in action during the Battle of Pocotaligo, was promoted to the rank of Sergeant. Corporal Samuel Kunfer also was promoted to the rank of Sergeant that same day. Assigned in February to the Provisional Division of the 2nd Brigade of the Army of the Shenandoah, the men of the 47th moved, via Winchester and Kernstown, back to Washington, D.C. On 21 February, Private George Hoffman died at the Union’s hospital at Annapolis, Maryland. Private Henry S. Romig was then discharged on a Surgeon’s Certificate of Disability on 11 April. Letters home and later newspaper interviews with survivors of the 47th Pennsylvania indicate that at least one 47th Pennsylvania Volunteer was given the high honor of guarding President Lincoln’s funeral train while others may have guarded the Lincoln assassination conspirators during their imprisonment and trial. On 21 April, Private William Hinkle was promoted to the rank of Corporal. On 18 May 1865, Private Charles Acher (alternate spelling: “Acker”) was discharged on a Surgeon’s Certificate of Disability while Private Benedict Glichler was honorably discharged by General Order the following day. Captain Levi Stuber of Company I then advanced to the rank of Major with the regiment’s central staff on 22 May. As the Summer of 1865 approached, the reorganization of K Company rosters continued. Honorably discharged by General Order on 1 June 1865 were Privates William H. Barber, Tilghman Boger, William P. Heller, and William Noll. 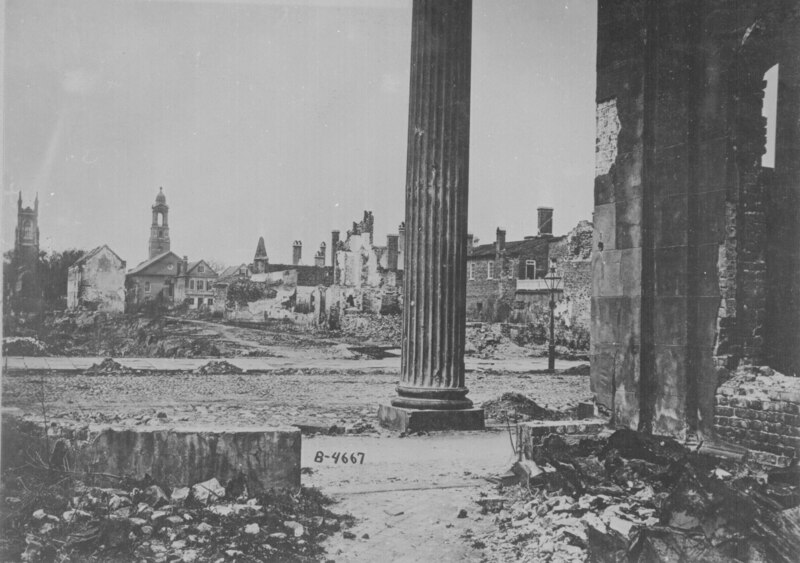 On their final southern tour, the men of Company K and their fellow 47th Pennsylvanians served in Savannah, Georgia from 31 May to 4 June. Again in Dwight’s Division, this time they were with the 3rd Brigade, U.S. Department of the South. On 22 June 1865, Private Joseph Frack, who had been wounded in action during the Battle of Cedar Creek, honorably mustered out by General Order, as did Private Peter Cope. Taking over for the 165th New York Volunteers in July, the 47th Pennsylvania Volunteers took up their new quarters in Charleston, South Carolina at the former mansion of the Confederate Secretary of the Treasury. Duties during this phase of service were frequently Provost (military police) or Reconstruction-related (repairing railroads and other key regional infrastructure items which had been destroyed or damaged during the long war). On 1 July 1864, Private John Saylor was promoted to the rank of Corporal while Privates William D. Schick and Alfred Smith were discharged on Surgeons’ Certificates of Disability on 4 and 19 July 1865, respectively. Privates Henry S. Toole, David Moesner, and Joseph Freas were honorably discharged by General Order on 8 July, 21 August, and 14 September, respectively. On 1 October 1865, Corporals Samuel Reinert and William Landis who had been wounded in action, respectively, during the Battles of Pocotalilgo and Cedar Creek, were both promoted to the rank of Sergeant while Privates Nathan Handwerk and Amos Slutter advanced to the rank of Corporal. Mustering out that same day, upon expiration of their three-year terms of service were Sergeant Phaon Guth, Corporals Martin Guth and William Knerr, and Privates Benjamin Amey, Tilghman Breisch, Harrison Handwerk, Edward Houser, John Keiser, Henry Savitz, and William Schlicher. Privates Franklin Smith, Jacob Geesey and Henry Hantz then mustered out upon expiration of their three-year terms on 9, 11 and 19 October, respectively, followed by Privates Alfred Diehl, James Sieger and Charles Stout on 28 October. But, once again, disease was a major foe. Sometime during the Fall of 1865, Private Edwin Gross fell ill with congestive intermittent fever, and was confined to the Union Army’s Post Hospital in Charleston, South Carolina; he died there on 30 October 1865. Initially laid to rest in grave number 26 at Charleston’s historic Magnolia Cemetery, according to federal burial ledgers, his remains were later exhumed and reinterred at the Florence National Cemetery. The departures from Company K continued through November as Private John G. Sigle was honorably discharged by General Order on 14 November. Finally, beginning on Christmas day of that year, the majority of the men from Company K, 47th Regiment, Pennsylvania Volunteers began to honorably muster out at Charleston, South Carolina, a process which continued through early January. Following a stormy voyage home, the weary, soon-to-be-civilians of the 47th Pennsylvania disembarked in New York City. They were then transported to Philadelphia by train where, at Camp Cadwalader on 9 January 1866, the 47th Pennsylvania Veteran Volunteers were officially given their discharge papers. Many went on to live long full lives. Some, like their former commanding officer, Tilghman H. Good, contributed greatly to their communities. Far more faded quietly into the background, content to take up farming, carpentry or other trades to support their new and growing families. 2. Berlin, Alfred, et. al. Proceedings and Papers Read Before the Lehigh County Historical Society. Allentown: 1922. 3. Burial Ledgers, in Record Group 15, The National Cemetery Administration, and Record Group 92, U.S. Departments of Defense and Army (Quartermaster General). Washington, D.C.: U.S. National Archives and Records Administration: 1861-1865. 4. Camp Ford Prisoner of War Rosters. Tyler, Texas: Smith County Historical Society, 1864. 5. Civil War Muster Rolls, in Records of the Department of Military and Veterans’ Affairs (Record Group 19, Series 19.11). Harrisburg: Pennsylvania Historical and Museum Commission. 6. Civil War Veterans’ Card File. Harrisburg: Pennsylvania State Archives. 7. Claims for Widow and Minor Pensions, in U.S. Civil War Widows’ Pension Files. Washington, D.C.: U.S. National Archives and Records Administration. 8. Comrade Zellner 66 Years Old Today: Youngest Civil War Veteran to Shoulder a Musket, in The Allentown Leader. Allentown: 26 March 1915. 9. Four Easton Brothers in the Civil War, on the website of the Sigal Museum (published 2011; retrieved 17 November 2015), and Historical Treasures: The Dachrodt brothers of Easton, in The Express-Times. Easton: 21 and 28 August 2011. 10. Hauser, James. A History of Lehigh County Pennsylvania From the Earliest Settlements to the Present Time including much Valuable Information for the use of Schools Families Libraries. Allentown: James Hauser, Pub; Jacks, The Printer, 1902. 11. Interment Control Forms, in Record Group 92, U.S. Office of the Quartermaster General (Record Group 92). College Park: U.S. National Archives and Records Administration. 12. Otis, George A. Photographs of surgical cases and specimens / prepared by direction of the Surgeon General by George A. Otis. Washington, D.C.: Surgeon General’s Office, 1861-1865. 13. Pennsylvania Veterans’ Burial Index Cards. Harrisburg: Pennsylvania Department of Military and Veterans Affairs. 14. Registers of Deaths of Volunteers, U.S. Adjutant General’s Office. 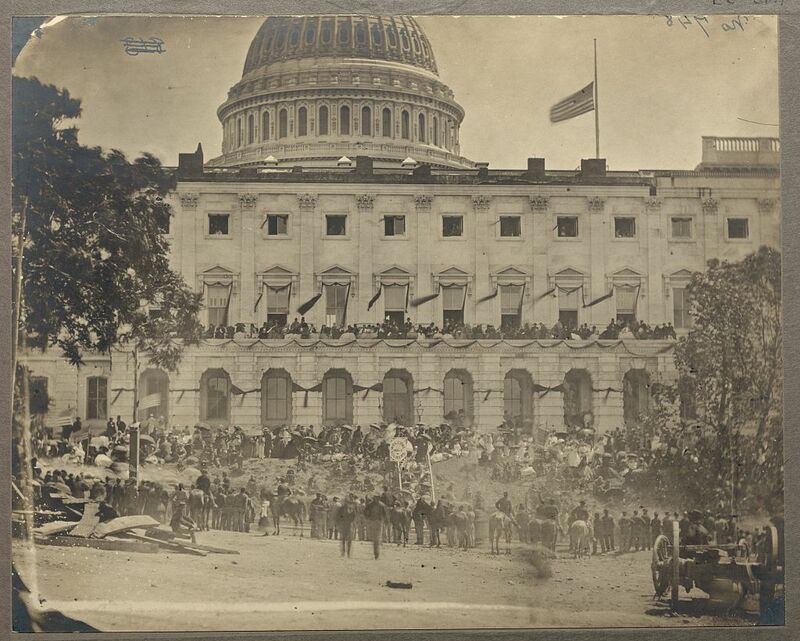 Washington, D.C.: U.S. National Archives and Records Administration: 1861-1865. 15. Reunion of the 47th Regiment: To Be Held This Year in Allentown on Usual Date, Oct. 22: Brave Comrade to Be Honored: Badge to Contain Portrait of Lieutenant Fetherolf, Cousin of Lawyer Samuel J. Kistler – Preparations for Event Already in Progress, in The Allentown Leader. Allentown: 18 July 1907. 16. Reunion of Veterans (mention of Benjamin Zellner’s war wounds), in Reading Eagle. Reading: 21 October 1911. 17. Schmidt, Lewis. A Civil War History of the 47th Regiment of Pennsylvania Veteran Volunteers. Allentown: Self-published, 1986. 18. 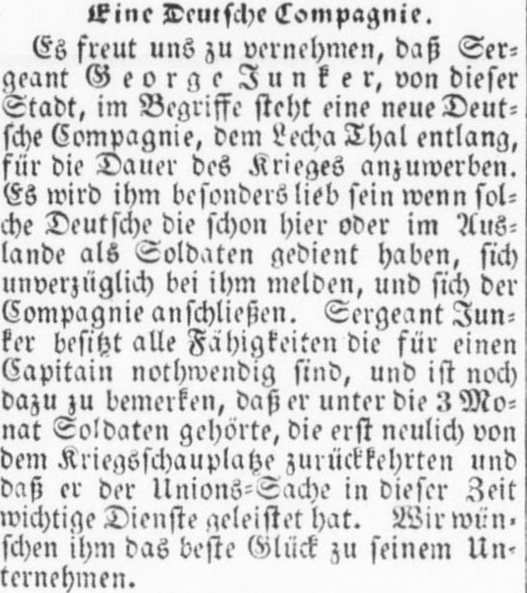 Zurückgefehrt (return to Pennsylvania for reburial of remains of Captain George Junker, Henry A. Blumer, Aaron Fink and Henry Zeppenfeld), in Der Lecha Caunty Patriot. Allentown: 3 December 1862.